With what looked to be the strongest fit line up today Queens set about the task of erasing the Albion Rovers nightmare result from last season in determined mood. Indeed the bench spoke volumes for the strength of the side with Colin Scott, Jim Thomson, Eric Paton, Brian McColligan and Derek Lyle all sitting on the sidelines. It took only a minute before Queens posted their intentions as Stephen Payne gave John O'Neill a chance to curl the ball goalwards only to see it pass on the wrong side of the post. Things did quieten down a bit after that and it was the twentieth minute before any more real action happened which culminated in a Stephen Payne shot skimmed just past the post. In twenty four minutes Stephen Payne looked to have scored as he dipped low for an English cross that was too high for McNiven - the new stand occupants celebrated a goal but everyone with a better view saw that the ball had gone past the post. John O'Neill was substituted for Derek Lyle shortly afterwards after a clumsy challenge that saw the returning goalscorer make an early exit. For a short period the inability of Queens players to score had the effect of allowing Rovers back into the game and good closing down play on Lovell and Bowey from Donnelly and Noble saw the side from Coatbridge in a rare attacking move. The half hour mark saw Queens re-assert their dominance with a siege on the visitors goals, a Stephen Payne header needed two attempts for Ewings to clear then a McNiven header at the far post brought the best out of the 'keeper with a great save, this was followed by a diving save/interception of a cross that fell to Gary Wood who could only blast over. A goal was coming though and it was a superbly set up and taken effort as Derek Lyle dummied a ball that ran through to Stuart Lovell, the midfield general cooly rounded the 'keeper and slotted the ball home to open the scoring for Queens. Derek Lyle should have increased the lead for Queens three minutes later but after being set up perfectly by David McNiven from and English cross the striker shot straight at Ewings in the Rovers goals. The half finished 1-0 for Queens. The second half saw no personnel changes at the break. However the pattern was the same with Queens pressing and making chances but unable to convert. A second goal did come however with just eight second half minutes gone as Derek Lyle turned and shot on the volley from a Stephen Payne cross - Ewings this time had no chance. Before the game could be restarted Eric Paton was brought on for Gary Wood in a straight swap. Rovers saw the need to produce a more attacking display and with a couple of substitutions went to a three at the back formation however this really just gave Queens more dominance with greater space to play in up front. With twenty minutes of the half gone Rovers number 9 George Wallace should have done better as he escaped the Dumfries defence as a cross ball beat everyone - he was left at the back post with an open goal but managed to screw the ball wide of the post. Derek Lyle was put through onto a long ball and as he chased it across the corner of the box 'keeper Ewings slid into the striker clearly bringing him down. 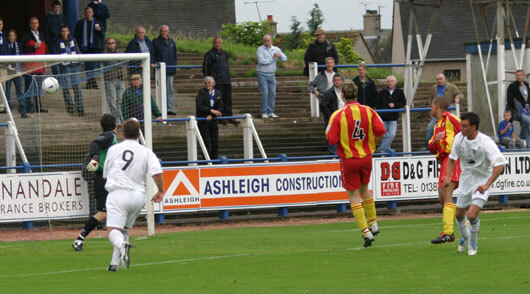 The resultant penalty was confidently smashed home by David McNiven to give Queens a three goal lead. Almost at the same time Steve Bowey went off and was replaced by Brian McColligan in the middle of the park. With the extra space came more chances and Brian McLaughlin gleefully accepted one with twelve minutes of the match to go as he found himself one on one with the keeper and slid it under the approaching Ewings to finish the scoring for Queens at 4. The score could have been more as Stephen Payne was unlucky with a free kick in the dying minutes as his effort beat everyone but not the post and Derek Lyle contrived to blast over an empty goal. Finally George Wallace should have pulled one back for Albion Rovers in the final minute as he beat both Carr and Reid to a high clearance and found himself one on one with Barnard - the 'keeper did well to put the young striker off enough to see him put his effort past the post. The performance was not particularly great, the first half was littered with poor finishing and over elaborate build up play, the second half improved matters but to be honest if the finishing had been what it should be then the scoreline would have been at least doubled.